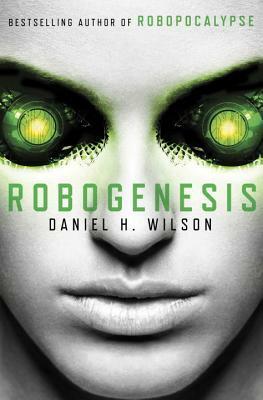 The stunningly creative, epic sequel to Wilson’s blockbuster thriller and New York Times bestseller Robopocalypse. The first book in this series, Robopocalypse, begins at the end of the robot war. Humans have prevailed and destroyed the evil artificial intelligence, Archos. In flashback we learn that Archos was created in an experiment that went horribly wrong. After becoming self-aware, it could not be turned off, shut down or deleted. It tried to destroy humans by spreading a computer virus creating a global network of machines with a mission to kill. In book two, Robogenesis, we learn that Archos has survived and fragmented into millions of pieces. Now a new war is about to begin. Humans vs robots vs human robot hybrids. Initially I had trouble staying focused on the story. The beginning was slow and the story wandered around a lot. Plus there are a lot of characters, some new and some returned from the first book, and multiple narrators. I should have liked this book a lot more than I did, but I never fully engaged in the story. I usually enjoy apocalyptic stories and expect them to be bleak and depressing, which this was, but it was more gruesome than I like with a lot of violence and graphic descriptions of fights and battles. This is a very action driven novel with bold characters that come to life, but there is not a lot of character development. I had trouble relating to them or even liking them. I could only vaguely remember those from the first book and was struggling to understand the bigger picture. This is not to say it was a bad book, it just wasn’t what I was expecting. The writing was good and all the action sequences would make a good movie, but as a book it was difficult to follow. This is the second book in a trilogy and I would recommend reading book one first. Readers that like a lot of action and fight scenes will enjoy this one. Be warned, the ending is left open for a third book. And yes, I will most likely read that one too. An ensemble cast usually makes it easier to follow the audio version, but it didn’t help me with this book. While the voices were fine, the pacing was too slow for an action novel. Perhaps in an attempt to sound robotic, the narrators spoke slowly and deliberately, but that only made an already long story feel much longer. I also have a print copy and alternated between formats. This was one of the rare times I found it easier to read in print. I can pretty much look at the cover to figure out this one isn’t for me. Leslie, thanks for sharing your honest thoughts about this audiobook. I hope you will stop by my blog soon as I’ve reviewed a new sci-fi novel!